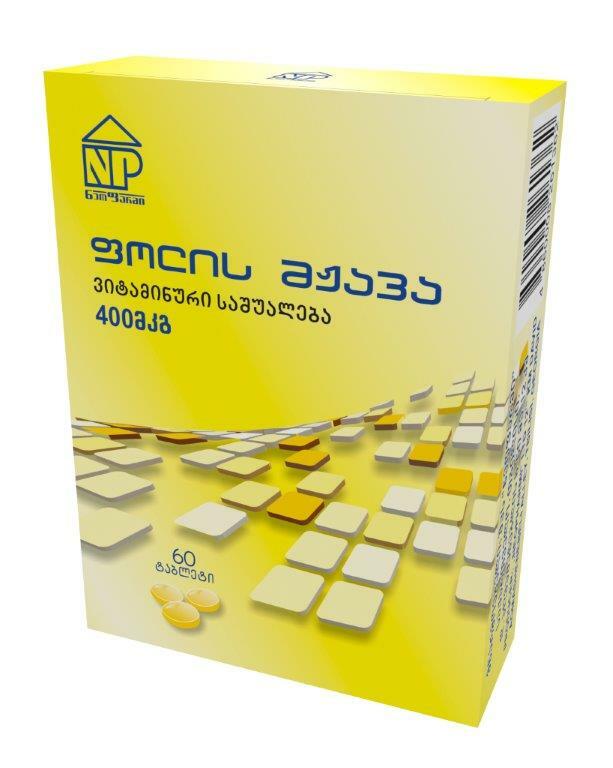 Description: Light yellow tablets. Dark insets in tablets are permitted. Aiding substances: Lactose, polyvinylpyrrolidone, calcium stearate, starch, talc. Pharmacological operation: Folic acid belongs to B group vitamins. Folic acid is metabolized in organism to tetrahydrofolic acid. It is a coenzyme, which is necessary for normal maturing of megaloblast and production of normoblast. Folic acid stimulates erythrogenesis. It participates in synthesis of amino acids, in an exchange process of nucleinic acids, purine, pyrimidine and choline. Pharmacokinetics: After peroral application the preparation is absorbed from duodenum and proximal part of small intestines. 98,5 % from the entered dose is defined in blood after 3-6 hours. Before absorption folic acid is restored by means of enzyme (dehydropholatreductase). Deposition and metabolism of folic acid is carried out in liver. 50 % of dose is eliminated with urine. · Treatment and prevention of anemia during pregnancy and lactation period. · Anaemia developed through deficiency of folic acid. Contra-indication: Additional sensitivity towards folic acid, deficiency of cobalamine, children age, Biermer-Ehrlich anemia. Application ang and dosage rule: Preparation is taken perorally. For deficiency of folic acid - 400 mcg (1 tablet) a day. For prevention defect development of nervous stem while first term of pregnancy - 400-800 mcg (1-2 teblet) is prescribed. Side effects: Allergic reactions: rash, itch, bronchospasm, erythema, heat. From the side of gastro-intestinal tract: nausea, meteorism, bitter taste in mouth, anorexia. Other: Long term usage of the preparation may cause B12 hipovitaminosis. Caution: Long term usage of the preparation may cause reduction of cyanocobalamin concentration in blood. At time of Biermer-Ehrlich anemia for the purpose of avoiding neurologic complications the combination of folic acid and cyanocobalamin is expedient. Pregnancy and lactation period: Application of the preparation is inevitable while pregnancy preparation period (1-3 month earlier before planed pregnancy) and in first term of pregnancy. Interaction with other medical means: In combination with chloramphenicol, neomycin, tetracycline, absorption of folic acid decreases. In combination of folic acid with phenytoin, pyrimidine, sulfasalazine, chloramphenicol, hormonal contraceptives, their therapeutic effect decreases. Overdosage: Overdosage may be occurred in case long-term usage of the preparation (more than 1-2 month) in doses more than 1000 mcg a day, or while combination of the preparation with other vitamin-mineral complexes. Order of issue: Pharmaceutical product group III group - (prescribed without prescription). Storage conditions: Store at 15-25ºC temperature, in a light protected place, keep away from children. It is forbidden to use the preparation after the term expires or having defects after the visual inspection. Secondary packing: 3 blister in a cardboard box.